You've probably read this in my blog sometime last year, but a lot of you have been asking about fish pedicure lately ( doctor fish ) that I decided to make a blog post out of it. I'll be answering some common questions, right here and now. 1 What is fish pedicure? 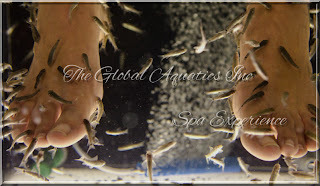 Fish pedicure is actually a developing trend in spas, especially in UK. It involves small fishes, Garra Rufa or known as doctor fish to nibble on your skin...The word is nibble, not bite. They're basically toothless at least the genuine ones are. 2. What do you mean genuine garra rufa? What are these... like diamonds? Well some people consider them as precious as diamonds because I've heard of reports of these little fishies helping them with their skin conditions. But that's not the point. 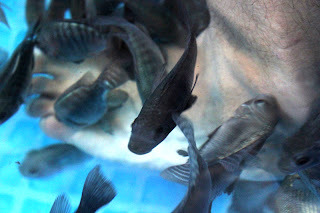 The point is some spas are saving cost and buying "fake" ones... Like tilapias, unlike the real garra rufa, they bite and have little teeth. I'll explain it as best as I can, however I'm not that much expert in fish, it's hubby's thing. You can probably see in the first picture that the real ones mouth are facing downwards wherein the fake ones are "straight- ahead" kind of type. 3. When was Garra Rufa discovered? How long has this been going on? For more than a hundred years, before you and I are born... They were used in Turkey where they basically originated from. 4. Do all Garra Rufa nibble? Yes, at least the real ones do. These little guys have a natural inclination to nibble. 5. Ok, so what are the benefits? That greatly depends on the person. For me, the greatest benefit is stress relief and relaxation. But it did leave me with smooth, sandal-friendly feet. For people with psoriasis or eczema, this could also possibly help. But nothing beats a doctor's check up . 6. Are fish pedicures sanitary? As with all spas, that depends on the management and the owner on how they sanitize and maintain their spa equipments, accessories and such. People experience problems with spas that doesn't involve this fishies, just the normal creams, rocks, or oils. My point is that there would always be things that people would complain or will be unhappy about. So far, I've never had any problem with fish pedicures. But if you're really finicky ( like me), you could purchase your own fish pedicure. I will link it down below. 7. Are they hard to maintain? Not at all. Just by the thought that I could maintain them easily( I'm not an experience aquarist by the way) means that anyone can as well. 8. Is it worth it? Definitely. It's an exciting new experience for the summer or for all seasons. I've seen people lining up outside fish spas just a week ago ( or was that two weeks ago, can't remember exactly). Well that would be a yes. But that's part of the fun! 10. You got me interested. 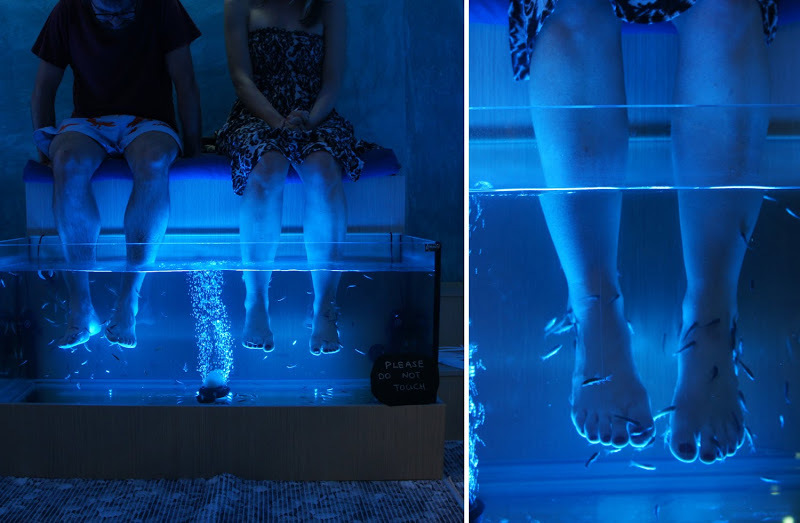 Where can I experience fish pedicure? Disclaimer: This post was in no way sponsored. I bought the Garra Rufa with my own money, ( even paid for the shipping ). I am not compensated in anyway for doing this review.